In the past, I have had the occasion to write blog posts about various aspects of financial literacy. There are many well-done Web sites created by experts in the field of personal finance that can be helpful to ensure students master the financial literacy skillset. There is now a no-cost, engaging and informational online game from T. Rowe Price titled Star Banks Adventure available for teachers and students to instruct and learn about financial concepts within a gamified environment. Star Banks Adventure is also available as an iOS, Android, and Amazon Fire app. Just go to the Star Banks Adventure game site for links to them all. The Star Banks Adventure game targets students in grades 5-8 and it includes puzzles and quick quizzes dealing with financial and personal finance concepts and is set in a sci-fi environment. I am not an experienced gamer, but the Star Banks Adventure game provides live demos right within the game, so I was able to catch on quickly how to maneuver and move through the levels. Each level builds upon the concepts in the previous level, so students get a deep-dive into each concept. The Star Banks Adventure game was intended to help teachers introduce real world money concepts to students in middle school. There is a great curriculum matrix included within the teacher section of the Classroom Edition. The concepts taught in the game are mapped to national standards in personal finance, national standards in economics, and the Common Core State Standards. 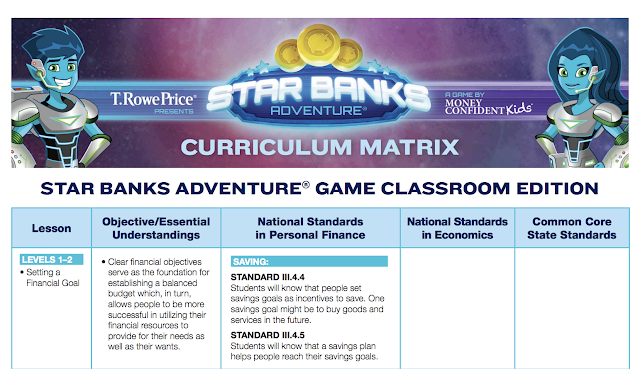 Below is a section of the curriculum matrix for levels one and two of the Star Banks Adventure game. 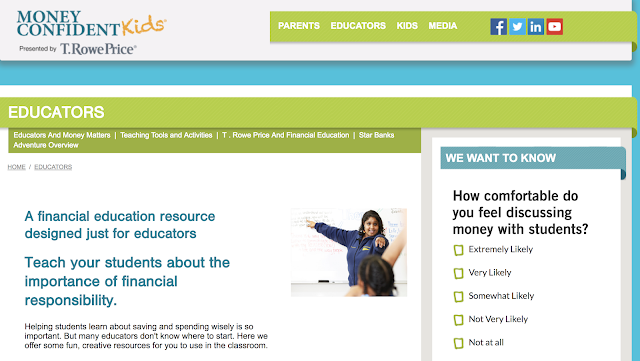 T. Rowe Price offers many additional financial resources for educators on their Money Confident Kids site. This site provides background information on financial concepts and includes downloadable magazines for students, print resources, videos, activators, and more. I suggest starting at the Teaching Tools and Activities page of the site, which includes PDF guides for both middle school and high school teachers. The Money Confident Kids site also includes a parent section to help parents reinforce some of these personal finance concepts at home. The Classroom Edition of the Star Banks Adventure game includes an administrative dashboard for the teacher. Teachers create their own account on this page. In addition to including how-to tutorials for the Dashboard itself, the Dashboard allows the teacher to create online classroom groups, manage these groups, monitor their students' progress, and compare their students' data with other classrooms in the United States. In the Teacher Dashboard area there are also tutorials introducing each of the six financial concepts included in the game -- setting a financial goal, prioritizing spending, rate of return, asset allocation, inflation and time horizon, and diversification. Teachers can create as many classrooms as they need in the Dashboard and also view each student's progress and well as the aggregated classroom progress. Students have both a Classroom ID and User ID, neither of which include the real name of the student. Fun pseudonyms for the student names are generated as the teacher creates the User IDs. Starting at the beginning of the game and moving through the levels helps reinforce the skills as they are learned. However teachers can have students work on a specific subject if they wish and jump to a specific topic. I tried out the online version of the game on both Mac and Windows laptops and and on iOS, Android, and Google Fire devices. It worked flawlessly on all of these. It does not seem to run on the Chromebook nor with the Google Play Store install on my Asus Flip Chromebook. The Star Banks Adventure game provides a fun, engaging, educational, and informative way for students to learn about personal finance and becoming financially literate. Give it a try with your students! This is a sponsored post on behalf of We Are Teachers and T. Rowe Price. I received compensation for this post, however all opinions stated are my own. STAR BANKS ADVENTURE and MONEY CONFIDENT KIDS are registered trademarks of T. Rowe Price Group, Inc.